The Miller® Bobcat™ 200 Air Pak™ Diesel is a 210 amp multi-process welder, 6,500 watt AC generator and a 30 cfm at 175 psi rotary-screw air compressor. The Bobcat 200 Air Pak Diesel features a Kubota® 19 HP, three cylinder diesel engine that supplies air compressor and welding power, even at idle. 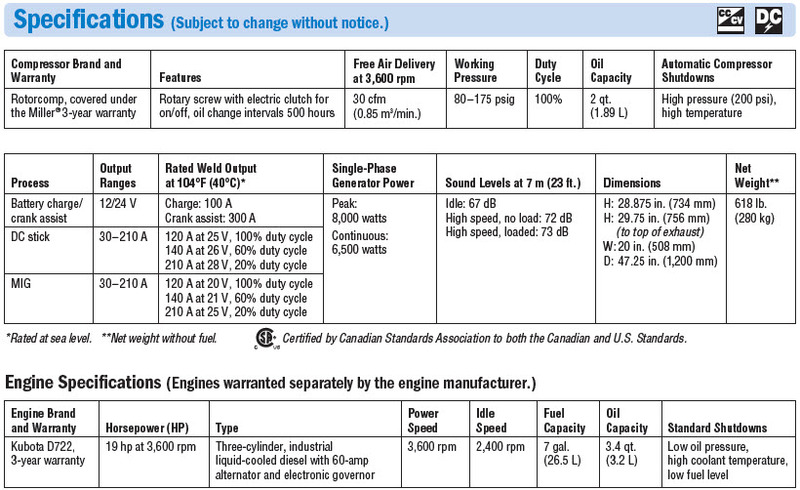 The Rotorcomp® rotary-screw air compressor produces 30 cfm of air at a pressure range between 80 and 175 psig. It easily powers virtually any air tool, including 3/4 inch and 1 inch impact wrenches. The rotary-screw design outperforms and outlasts reciprocating compressors and since there is no air tank, you can access the full output of the air compressor immediately. The Bobcat Air Pack 200 is capable of stick and MIG welding up to 210 amps. It also produces 6,500 watts of AC generator power AND 100 amps of DC current to charge 12 volt and 24 volt batteries. It even provides up to 300 amps of cranking power. The Bobcat 200 Air Pak comes complete with Miller's True Blue™ 3 year warranty and Kubota's 3 year engine warranty. Air compressor - 30-cfm rotary-screw compressor that can power virtually any air tool, including most 3/4-inch impact wrenches. The rotary-screw air compressor provides air on demand and is more reliable. It allows techs to complete tasks without having to stop to let the compressor recover, improving their productivity. The Bobcat 200 Air Pak Diesel provides 20 cfm of air output at idle or 30 cfm at full speed. Generator Power - 6,500-watt generator handles most jobsite electrical needs - electrical tools, lights, and more. Two 120-volt duplex receptacles and one 120/240 volt receptacle provide 60 Hz current to support jobsite electrical tools, lights, and even high-demand applications like plasma cutters and TIG welders. Battery Charge/Crank Assist - produces up to 100 amps of DC current to quickly charge 12- and 24-volt batteries. Jobsite equipment with weak batteries can get up to 300 amps of crank assist. Multi-Process Welding - with 210 amps of output (100 amps while idling), so technicians are prepared for each welding job they encounter in the field. Inverter-based welding delivers a smooth, stable arc that�s forgiving of variations in arc length and travel speed, so it�s easier for technicians to produce clean welds and avoid the time and expense of rework. Auto-Speed™ - Advanced Auto-Speed technology automatically adjusts engine speed to match weld and battery charge demands - reducing fuel consumption, maintenance costs and noise for safer, more efficient jobsites. Testing - Ruggedly built and rigorously tested to ANSI and CSA standards, the Bobcat 200 Air Pak Diesel is proven to withstand high temperatures, rain, salt, dust, impact, vibration and more. Its welding, auxiliary power, battery charging and crank assist systems are tested to meet the highest applicable industry safety standards. Maximize available payload - Reduce weight by up to 500 pounds and increase available payload by up to 24 cubic feet. Reduce fuel consumption - Minimize fuel costs by reducing truck engine idle time by as much as 75 percent or if you have a separate engine driven compressor by only operating one engine. Minimize operating costs - Potentially save more than $50,000 over ten years from increased fuel efficiency, decreased maintenance costs, and increased asset life. Professional appearance - The components of the Bobcat 200 Air Pak Diesel are concealed within a durable environment-resistant precision-engineered enclosure. 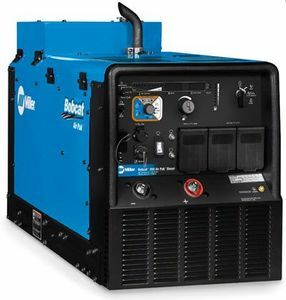 Genuine Miller® field installed air compressor oil heater for your Bobcat™ 200 Air Pak™ welder/generator. Miller® Bobcat™ 200 Air Pak™ Running Gear With Never Flat tires is a rugged, multi-terrain undercarriage. Miller Mid Frame Trailer has a 1,424 pound capacity and is built for Bobcats, Trailblazers and Big Blue products with less than 25 horsepower. Genuine Miller® air compressor service kit for your Bobcat™ 200 Air Pak™ welder/generator.